Segmenting Azure SDKCTP’s from production and how to tell. In Azure they have started created a Major versions as the signature to tell if the DLL is from a CTP or if it is in production. 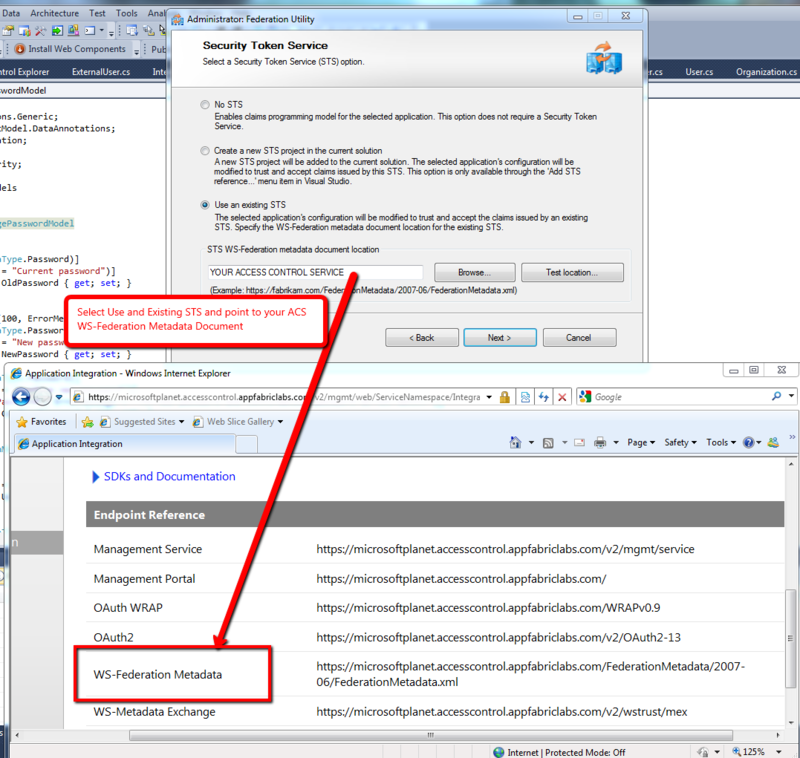 File Versions starting with a 2. are part of a CTP (usable at portal.appfabriclabs.com) however not usable in the current production cloud. 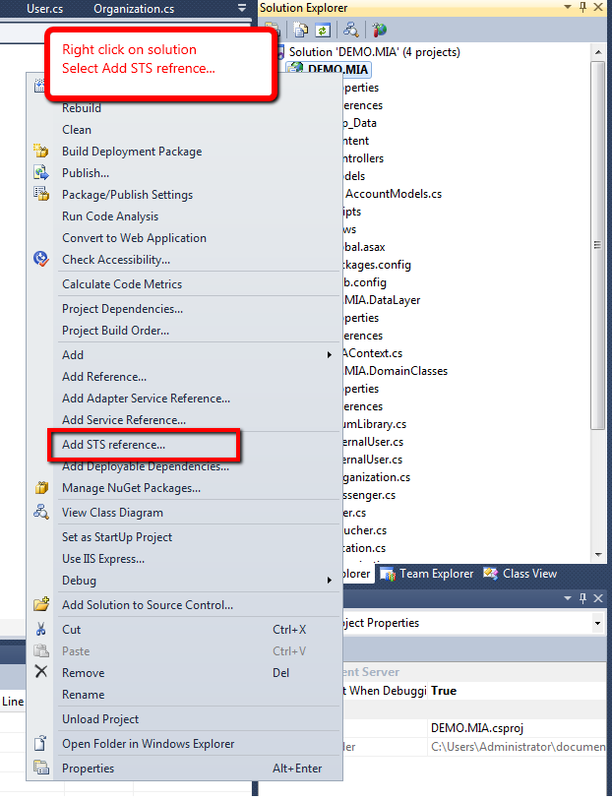 Startup Tasks on an Azure instance before the Role Fires up. You can create a user then use the RunsAs command within a script if needed. Make sure your commands are able to re-run without problem since you may come back up in a VM that you were previously in therefore you could try to install something that may throw an error if bootstrapped again. in the CSDef (Service Definition) file within the Role Element you can add a <Startup/> command and have it fire off Executables, Batches, Commands(CMD, not command line) etc. The commandLine is a link to the actual file you would like to execute. * Limited uses same level of privileges as the rest of the Application. The taskType can be left off since the default is simple, however if you would like the task to run in order (The startup before the role starts), you will need to keep it marked as simple or remove the taskType all together. You can also set Background or Foreground tasks. A background task will run in parallel with the Role instance. The Foreground tasktype will keep the role running as long as the foreground task is running. For task type simple, they are expected to return an exit code 0 to indicate successful completion. Without 0, the next task or role will not start. 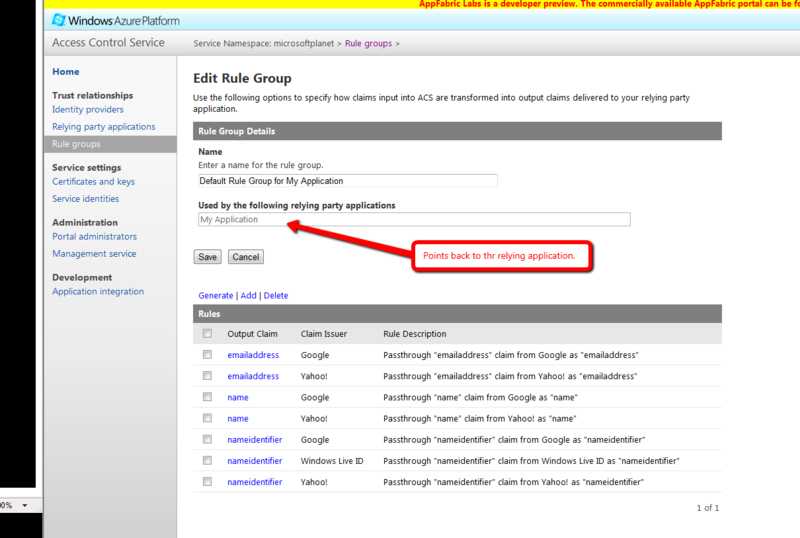 Using Azure ACS in a web application through WIF. Use the WIF plugin within Visual Studio. Keeping a collection of Tools in one spot. 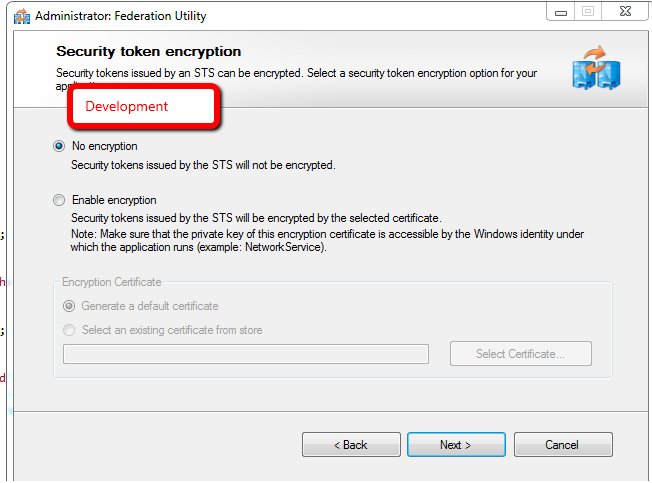 http://archive.msdn.microsoft.com/SelfSTS/ Self STS is a tool to help emulate Active Directory STS calls. ACS choreography. – From a Scott Seely video. 5. Redirects based on token to service login. 6. After login, it gives user back a token for ACS. 7. 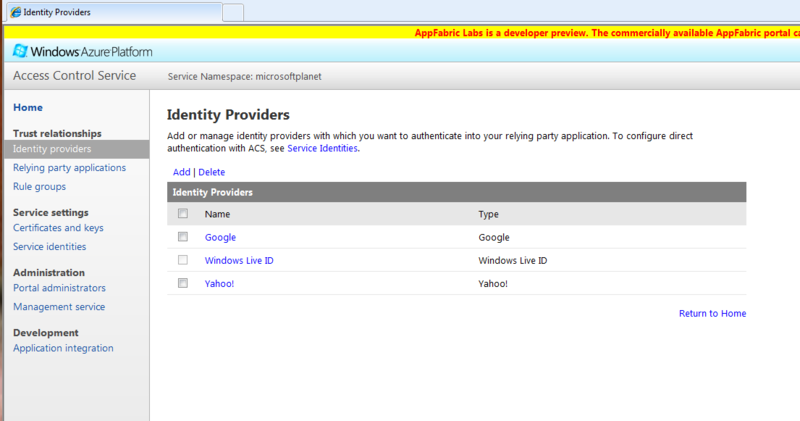 Redirects the user back to ACS with the provider token. 8. ACS returns the user an ACS token. 9. The User is redirected back to teh page with the security token. 10. THe page then returns the page response. Only happens once per session. Not each page unless they leave the session. post is to help people who are just now getting into Azure with the incredible new features that have come out with the June CTP. Step 2: Follow the link to : http://portal.appfabriclabs.com/. 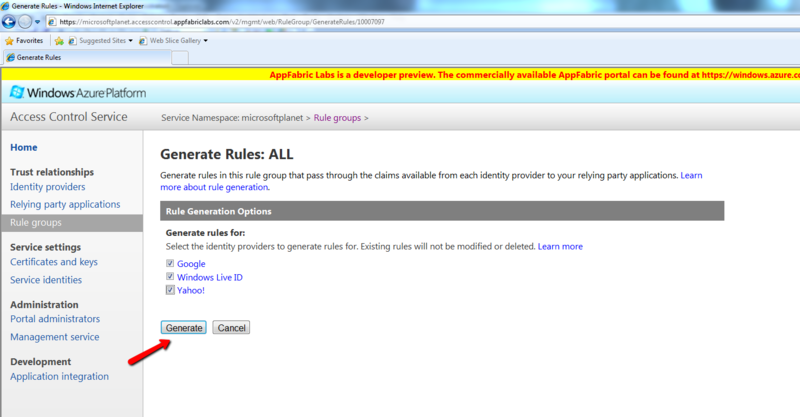 •Sign in to the AppFabric Management Portal at http://portal.appfabriclabs.com/. 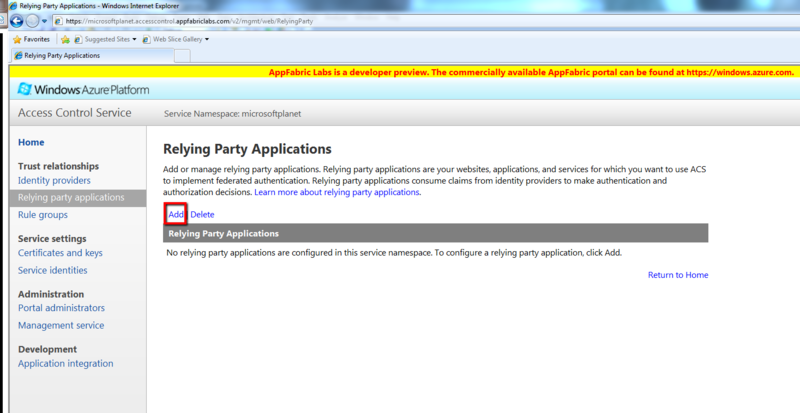 •Choose the entry titled “Applications” under the “AppFabric” node on the left side of the screen. •Click on the “Request Namespace” button on the toolbar on the top of the screen. 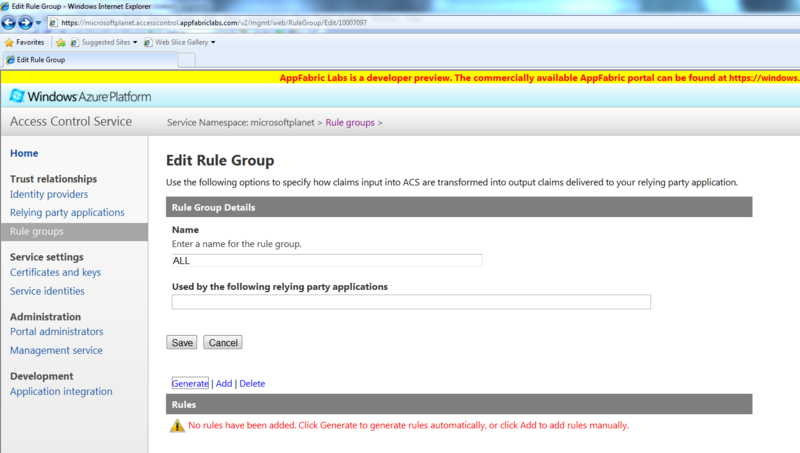 •You will be asked to answer a few questions before you can request the namespace. 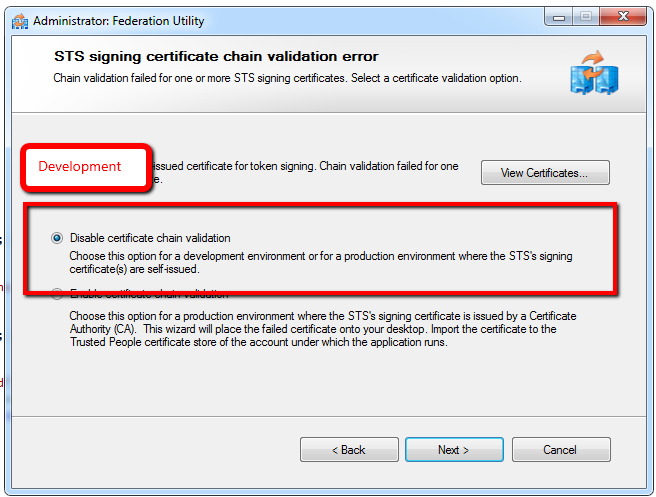 •Your request will be in a “pending” state until it gets approved and you can start using the CTP capabilities. 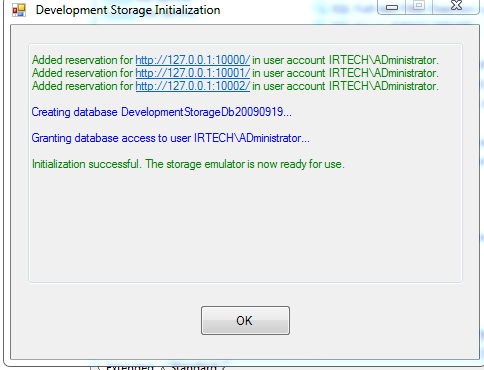 Then locate the DSINIT file that will be unpacked during the installation. 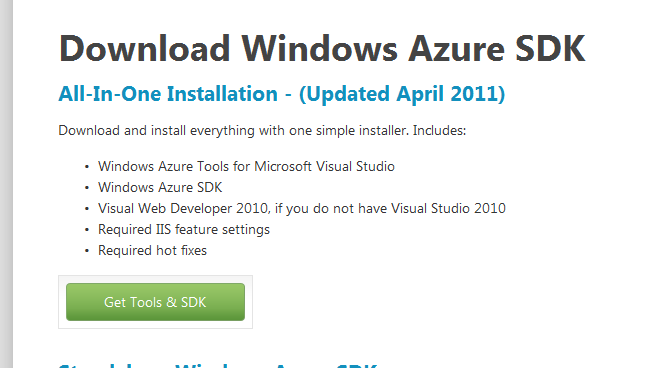 C:Program FilesWindows Azure SDKv1.4bindevstore open a command windows and use the following command. 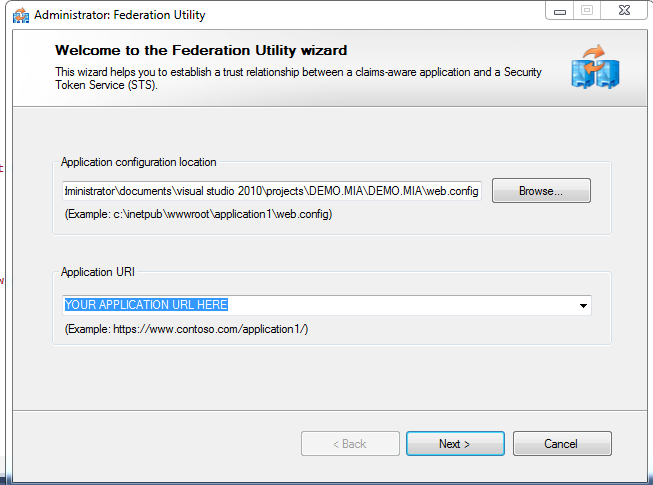 Changing the C:Program FilesWindows Azure SDKv1.4bindevstore directory name to your specific location. Do not put a SQLinstance in the place or it will null out the instance. One or more initialization actions have failed. 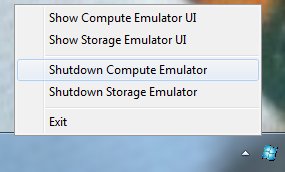 Resolve these errors before attempting to run the storage emulator again. 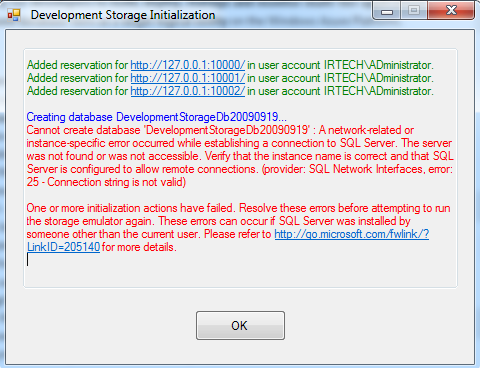 These errors can occur if SQL Server was installed by someone other than the current user. Please refer to http://go.microsoft.com/fwlink/?LinkID=205140 for more details. See Sun Tsu’s Blog Post. If it was installed properly then you should see the developer fabric ICON in the bottom right corner of your screen. Azure June CTP dropped last night! Part -1 BizTalk, the rumors, the past and the future. 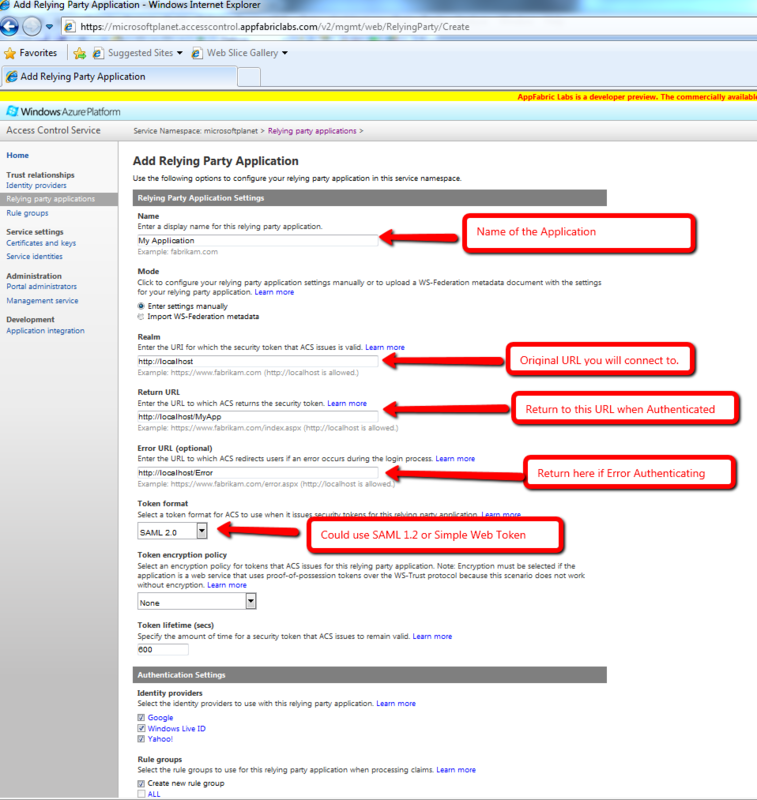 Info on May-June CTP for Azure. 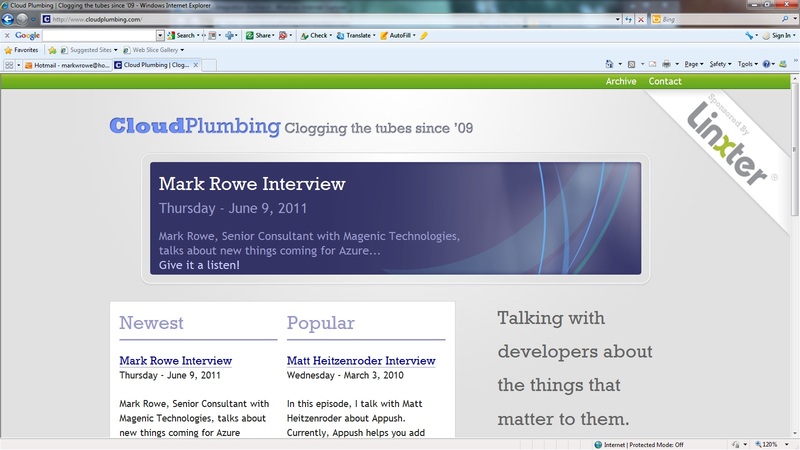 Has an intro to Topics and Queue’s as well from David Ingham. Good way to get ahead of the curve!